Neil Bates, design Director for Vivarail and Creactive Design with Adrian Shooter and Ken Skates – Minister for Economy and Transport. The Class 230 trains which Vivarail are developing are part of the £5 billion investment being made by Transport for Wales across Wales and the Borders and are expected to go into service first, in North Wales, during 2019. Ken Skates visited Vivarail this week to see the new Transport for Wales trains that will transform the customer experience for rail users in North Wales. 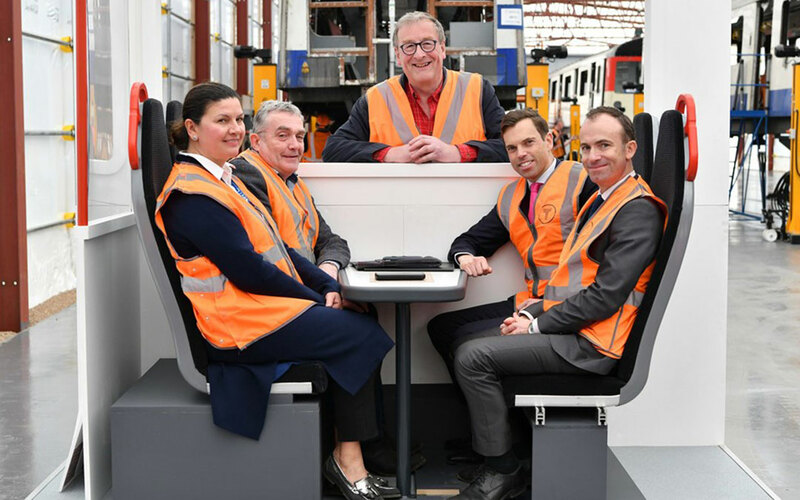 “It’s been great to visit our rolling stock manufacturer, Vivarail and to see the Transport for Wales trains that will be running on routes in North Wales later this year. “We’ve had an opportunity to take a ride on the trains on Vivarail’s test track and gain a real understanding of the hybrid engine. Not only will these transform the experience on board for rail passengers in North Wales, they will use 25 per cent less fuel and have a regenerative braking system that captures energy back into the batteries. “These modern trains demonstrate our commitment to sustainability and the environment, as well as our ambitious plans to transform the experience for rail users.